If a tree falls in the forest and nobody is around to hear it, does it make a sound? I’ll let you decide. If a food truck gathering makes itself a permanent home, does it loose its appeal and its customers? Heck no. At around 6:15, Kelle and I hurried over to SoMa, just a hop, skip, and a jump from the PTC office. We lucked out with a parking spot right across the street strEat! In true hipster/San Francisco/Scoutmob fashion, sticky faux mustaches were handed out to each guest during registration. And then it was off to the races. In the beginning, we tried to be strategic while working our way through our punch cards. It was clear that some trucks had quite the following, and some lines were starting to get long. We decided to swing by Sunrise Deli for our first bite: Falafel and Hummus. With a tagline of “The Best Falafel in Town” expectations were set pretty high. Boy, did they deliver! 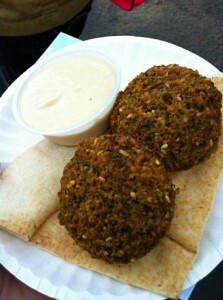 I could easily have eaten 3 more plates of hot, fresh, tender falafel. 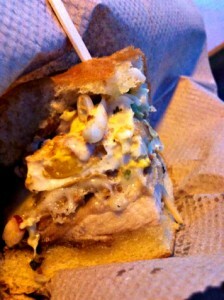 Thank goodness Sunrise Deli has 4 other Bay Area locations – 3 in SF – I will be back! This truck gave Kelle and I just what we needed to keep going. While still enjoying the best falafel in town, we decided to get in the long line for Slider Shack. This single truck operation now toggles between the SoMa StrEat Food Park and the sidewalk at 1st and Howard. With a “sliding scale” for pricing, Slider Shack is an ideal truck to take on with friends (4 sliders for $12!). Kelle and I were both served beautiful Kalua Pork Sliders. 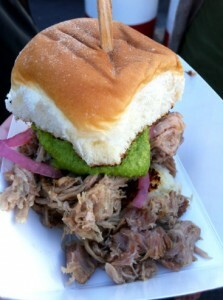 Slow cooked pork with Hawaiian Alaea salt, Slider Shack’s spicy Polynesian green sauce, and topped with pickled red onions. YUM. SPICY. My aversion to spicy foods was not going to stop me this time! We were in such a state of food bliss that we didn’t notice the beast of a line forming across the park. 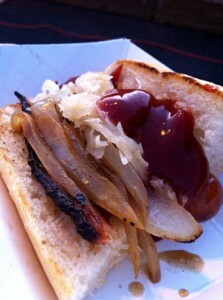 Instead, we absent-mindedly got in line for La Pastrami, the truck right next to Slider Shack. Luckily, this line was short and sweet. It wasn’t long before we were greeted by a nice man handing us two Pastrami Tostadas of pastrami, lettuce, shredded cheese, and tasty mustard. Plain and simple: delicious. Their full menu includes many more pastrami-filled options that what you see here – the perfect summer snack for a warm day at the food truck park. 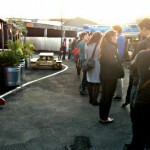 We then worked our way over to Mr. Nice aka “San Francisco’s best, organic, food truck” aka the line that spanned 50 people. 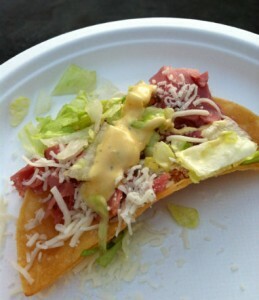 The pastrami tostada was no longer enough to hold us over. The weather that had been surprisingly pleasant, and held out for most of our adventure, turned on us. But we were determined. After what seemed like 3 days in the rain (it was not raining), it was our turn to order. Kelle immediately knew she wanted the Wellshire Bacon Wrapped Hot Dog. I took a bit longer to mull over the options, and in the end, was still torn between the Chicken Apple Bourbon Sausage and bacon-wrapped paradise. After quick consultation with who we believe to be Irish born – now longtime SF local – Pete Fraser (owner), my bacon-wrapped fate was sealed. Absolutely no regrets, though I apologize for not snapping a photo before slathering my dog in ketchup. Mid-devour, Kelle and I hustled over to Adam’s Grub Truck. Let me just say, I’m SO glad we didn’t give up on filling our punch cards. 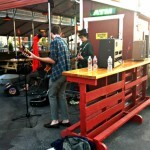 Adam himself was standing outside his truck speaking to curious park-goers. He was super friendly, helpful, and funny! We both opted for The Falkor: panko-crusted fried chicken with pepper-jack cheese, hickory smoked bacon, and a jumbo fried egg topped with grubbin’ Asian slaw on a toasted brioche bun. LOVE. Our sandwiches were cut in half, and while we honestly could not have finished a whole sandwich after the marathon dinner we had just attempted, I would gladly go back any day for any of the sandwiches on the menu. Yes, even the Ultimate Adam Bomb. Each of Adam’s sandwiches sticks with the Asian fusion theme, and Liquid Dragon fire can be added upon request – for the daring. Trust me, I will eat my way through this fantastic menu. At this point, the sun had all but disappeared. Kelle and I were starting to shiver, and she still had to make her trek home. We decided to get our final treat to-go. Dear Garden Creamery, thank you. 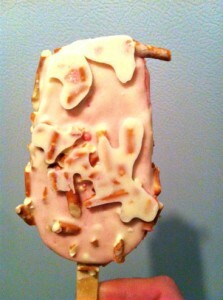 Kelle ordered the Chocolate sorbet, while I opted for the Strawberry Pretzel Pop dipped in White Chocolate. Never before had I tried a popsicle for grown-ups. Biting into the pop, the white chocolate shell easily gave way to smooth, creamy, sweet strawberry goodness. Kelle and I had split up before either of us actually tried our desserts, but apparently hers was so good that she had to text me about it. More. Please. Soon. I would definitely mark this adventure as a success. 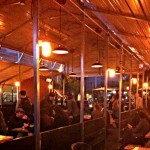 My next goal is to get the entire PTC office over to this “food truck mecca” — perhaps as our next team building event? Should you find yourself hungry in San Francisco with a handful of cash, I urge you to check it out, too!